The display windows in baudline are a collection of many different ways of viewing sample data. The display sub menu on the right is accessed by holding down the third mouse button in either the spectrogram or the spectrum window and choosing the displays item. From this menu you can configure the main spectral windows, or you can open an entirely different view into the data. Time-domain views are sourced directly from channel mapping while the frequency-domain views pass from the drift integrator. All of the views display real-time data and are zoomable, while some of them display instantaneous slices; others have scrollable time histories, and some can even copy and paste signal data. The average or the spectrum windows can be the source of many of the measurement windows. The diagram below illustrates the display signal flow. This is baudline's main window which happens to be in the pause mode. It consists of the spectrogram and the spectrum sections, both of which are described below. While in the pause or play modes the timebase scroll bar and the color ramps are displayed. While in record mode, data is being collected and processed real-time, so the timebase scrollbar and the color ramps disappear. The title bar on the top contains some useful information such as F# bank selected and status, the FFT size, the sample rate, and the frequency and timebase zoom factors. Also the file name, if any, will be shown here. Depending on the window width, some or all of these are displayed in the title area. A common theme in all of baudline's displays is the ruler; it wraps around the top and left axes of all display windows, it has pointer arrows that follow the cursor, tick marks, numerical position, and label units that also convey scale. The top section of the main window is the spectrogram area, and in this example it is just one column of stereo data that is purple and green overlaid and blended together. Up to 3 columns with 3 overlays (RGB) equals a maximum of 9 positions that can be displayed. See input channel mapping for configuration information. The view on the bottom of the main window is the spectrum display. The peak smoothing option is also part of the spectrum display. spectrogram display (white horizontal line) defines and tracks a slice of signal that is displayed in the spectrum display. Moving the frequency scroll bar at the bottom of the display will move both the spectrogram and the spectrum sections. They are locked together in the frequency dimension. When the window gets wide enough the frequency scroll bar disappears. Hz scaling can also be done on the frequency axis if the window is narrow or if a large FFT size has been selected. The minimum zoom factor is 1X which gives the most detail; it also happens to be the default value. Zooming out gives a birds eye view which is useful when doing "weak signal" work with very large FFT's. See Hz scaling. Note that the main window can be resized or iconified and the spectrum window can be enlarged or shrunk by dragging the pane bar (the gray horizontal line that separates the spectrogram and the spectrum displays). These settings and window dimensions, like most settings in baudline, are remembered so that the next time baudline is run, everything is set up the same way it was at last exit (see the session management section for more details). In the screenshot above the vertical lines are the harmonic helper bars. When the second mouse button is held down in either the spectrogram or spectrum window the harmonic helper bars appear. They track any mouse movement and when the second mouse button is released they disappear. The purpose of the harmonic helper bars is to be a quick and simple means of determining which harmonic content is related and what exactly is the frequency of the fundamental. Sometimes the harmonic content of a signal is straightforward and all the details can easily be "eye-balled" with the mouse and the Hz display. Other times the harmonic content is rich and complicated like in the above example. Traditionally, in the past, a scientist would write down all the frequency peaks and then use a calculator or spreadsheet to determine the harmonic ratios. Such a procedure was always a royal pain and it never really worked as well as it should have. Press and hold the 2nd mouse button down which will pop up the harmonic helper bars. Move the mouse around in the spectro windows and the fundamental frequency will change which will move all of the harmonic bars. See if the harmonic bars visually line up with the signals in your spectrogram display. Hit the left or right arrow keys and/or turn the mouse scroll wheel to perform fine tune adjusting of the fundamental frequency. Sub-pixel / inner-bin accuracy can be achieved this way. Release the 2nd mouse button and the harmonic helper bars will disappear. Or press the Shift key and the harmonic bars will transform into the periodic bars. Note that the harmonic helpers are also displayed and tracked in the Average window if it is open. The value of the fundamental frequency with fine tuning adjustments is displayed in the delta selected window. Press and hold the 2nd mouse button which will pop up the harmonic helper bars. 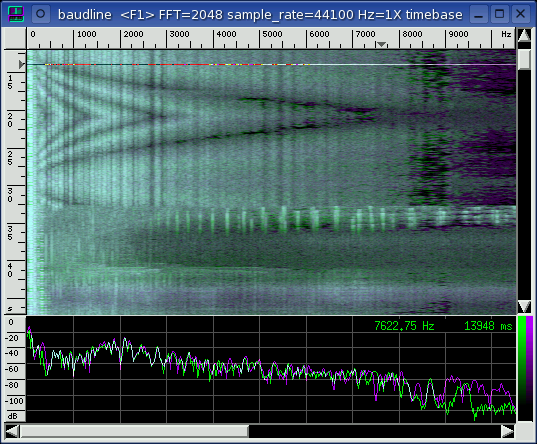 Move the mouse in the spectrogram display and align the time domain slice cursor to a point of interest. Press and release the Shift key. This will flip the orientation of the harmonic helper bars by 90 degrees transforming them into the periodicity helper bars. This action will also anchor the initial position (0 ms). Move the mouse and the periodicity bars will appear and move appropriately. The spacing of the entire grid changes. Rough measurements can be made quickly. Hit the up or down arrow keys and/or turn the mouse scroll wheel to perform fine tune adjusting of the delta periodicity. Sub slice resolution can be achieved this way. The periodicity bars are also automatically mirrored in the Waveform window if it is open. Click and hold the 1st mouse button in the spectrum window and the crosshairs will appear (see the illustration below). Move the mouse until the crosshairs are positioned to your measurement starting location. Press the Shift key and drag the mouse. The delta measurement box will appear and the delta text will display the frequency and dB difference from the starting point to the end point. Accurate measurements can be made this way. Release the 1st mouse button to make the measurement box and text disappear. The delta selected and the frequency range display higher precision delta measurement values for future reference. See the illustration below for a graphical example of the click, hold, shift, drag, and release operation. The spectrogram display is a flat three dimensional plot that is composed of spectrum slices. The axis are time vs. frequency vs. color (spectral energy). It is a very useful display for watching how frequency is changing with respect to time. Fine adjustments to the spectrogram color palette can be accomplished with the Color Picker and the Color Aperture windows. To the right is the popup menu for all of the spectrogram controls. The display can be enabled or disabled. The zoom control option pops up the zoom control window. With the menu shown above the vertical timebase scaling can be zoomed in or out. You may find tearing off this menu or using the Alt+arrow shortcuts faster and more convenient. See the keyboard reference tables for all of the hotkey shortcuts. The horizontal axis on the top ruler is frequency in cycles per second (Hz). The vertical axis on the left ruler is time in milliseconds (ms); note that depending on the zoom level the units can switch to seconds (s). The green middle section is the spectrogram which is made up of spectrum slices that have the dB values translated into color gradients. The brighter the green the stronger the peak. Both the term sonogram and spectrogram are used interchangeably in DSP literature. Both terms are correct. On the right is the time history scroll bar. Note that the mouse scroll wheel is attached to this scrollbar. Also the home, end, page up, page down, and arrow keys can be used to navigate the time axis. See the keyboard reference tables for all of the hotkey shortcuts. The white XOR'd line at 1250 ms is the cursor selector bar. It is the slice of spectrum at which the mouse cursor is currently pointing. Other windows such as spectrum and waveform have their displays locked to whatever position this cursor is at. The selector bar can be click and dragged to select a region of signal data. Whether you use the scroll bar, keyboard short cuts, or the mouse wheel, scanning large amounts of spectral data is quick and easy with this smooth scrolling window. When a region of data is being selected by the cursor bar, the delta measurement which is the duration appears as a heads up display next to the mouse pointer. When the mouse button is released the selection remains but the delta duration text disappears. The delta duration is simply the absolute value of the difference of the start position from the end selection position. In the above picture a duration of 4.819 seconds is selected. The spectrum display is the current slice of frequency data that the cursor is pointing to in the spectrogram window. To the right is the popup menu for all of the spectrum controls. The spectrum display can be enabled or disabled. The spectrogram pictured above was taken with this spectrum display option disabled, while the picture of the spectrum display below was taken with the spectrogram display disabled. Also the light gray grid lines can be enabled or disabled. The drawing type can be changed to lines, points, or bars. On slow, non accelerated video cards, drawing the spectrum with points will be faster but it won't look as clear or bright. The bars option is currently not implemented. The horizontal axis on the top ruler is frequency. Since this axis is shared with the spectrogram window, the units and the scale are the same. The vertical axis on the left ruler is spectral energy in decibels (dB). At the top is the 0 dB reference point which is defined to be the loudest level possible from the input source (16 bits). At the bottom of the ruler is -136 dB, which means 136 dB beneath the 0 dB reference signal. You may be asking yourself how can a 16 bit linear waveform, which has a 6 * 16 = 96 dB of dynamic range, have spectral energy with a signal to noise ratio (SNR) of 136 dB? For the answer click this link into the FAQ. The frequency spectrum for each channel is plotted Hz vs dB. When in the record or play mode the real-time stream is plotted here. When in the pause mode the slice defined by the cursor selector bar in the spectrogram is plotted. Multiple channels per column position are drawn with different color overlays. And multiple columns of spectrum are stacked next to each other horizontally. The green gradient color ramp on the right of the spectrum window shows the dB to color mapping that is used in the spectrogram window. The color ramps are chosen automatically so as not to conflict and they can be manually selected in the input channel mapping window. The on screen display (OSD) in the upper right corner of the spectrum window displays the frequency, dB, or time position that the mouse is currently pointing at. This is useful for pinpointing measurements. Peak smoothing takes the spectrum and performs either a peak hold and manual release or a peak hold and decay operation. Here is the popup menu for all of the peak smoothing controls. The display can be enabled or disabled. The draw type can be selected just like it can be in the spectrum window. Manually clicking the clear option or hitting the Delete keyboard button will reset the peak curve to zero. This is of particular interest when peak hold is selected in the decay menu. This is the rate in dB per second that each frequency bin decays. The decay rate is divided by the spectrum display's frame rate (FPS), and that is the amount that each peak bin decays. The peak hold option displays the largest peak until it is reset with the manual clear command. A smaller decay rate makes the peak smoothing curve react more slowly to signal changes while the max 4096 dB/sec rate is very close to the raw spectrum's snappiness. This is the spectrum window - same rulers, color ramp, and OSD. The orange peak smoothing spectrum is new. Notice how the orange curve traces out the motion of the moving spectral peaks. This is used to zoom the Hz axis in or out with a zoom factor from 1X to 64X. The minimum zoom factor is 1X which gives the most detail; it also happens to be the default value. Zooming out gives a birds eye view. This type of zooming on the Hz axis is also know as reduction scaling. The spectrogram and the spectrum windows share the same frequency axis. They are coupled and the Hz scaling parameter controls both windows. Not all zoom X factors will be available at all times. Availability is a function of transform size and the window width. For higher zoom X factors the FFT size needs to be increased and/or the main window width needs to be decreased. For the baudline default case of maximum window width and the 2048 point FFT size only the 1X zoom factor is available. Hz scaling can be control from the menu, the keyboard, or the mouse wheel. Zoom the frequency axis in or out by pressing the Alt+Left and the Alt+Right keys. Holding the Shift key while turning the mouse scroll wheel will also change the Hz scaling. When the Hz scaling zoom factor is equal to or greater than 2X then the amount of transform bins need to be reduced. For example if the Hz scaling is 4X then 4 transform bins need to be reduced down to 1 bin. The reduction algorithm controls how the bin scaling is performed. Which reduction algorithm option is the best? It depends on your application. The pick maximum option has more weak signal extraction power than the average or summation options. But the addition themed options are useful when comparative power measurements are needed. The min max pair option is unique in that is shows both the min and max choices at the same time but the configuration setup is more complicated.